In our efforts to exceed our customers' expectations and in an effort to support our "Trust Your Dealer!" mantra, we at AutoPrice Canada, have developed a Multi-level Inspection Program that enables us to provide a No Accident Guarantee. By developing a process that involves several different third party resources as well as implementing our own research and inspection program, we are confident in our ability to identify a vehicles condition as relates to accidents. At AutoPrice Canada, we access 95% of our inventory DIRECTLY from Manufacturers. (ie: Toyota, Honda, GM, Ford, Mazda, Chrysler, Nissan etc…) We access these vehicles from Manufacturers Lease Return Auctions all across the country, as well as in the United States. This means that 95% of our cars are 1 owner vehicles and that we purchase them directly from that specific manufacturers financing arm. We bid alongside the Used Car Managers and Buyers of that specific manufacturers stores. In other words, the vehicles we bid on can either end up in the used car lot at the Toyota store down the street, or just as easily, in our showroom. The benefit of accessing our inventory in this way, is that the Auction Houses that facilitate these sales, require the manufacturers to disclose certain information about the vehicles. These disclosure requirements are the first step in a series of processes that were developed to protect our customers from undesirable vehicles and to provide information on vehicles in our inventory. Our professional Buyers have over 65 years in buying experience. With this experience comes a tried and tested process that results in a superior evaluation process. Days before vehicles begin running through the lanes at auction, AutoPrice Canada's buyers begin doing their research online. They access closed or private member sites to evaluate the condition of the vehicles that are passing through the auction block. This allows us to evaluate the disclosures on the vehicles that we are in the market to purchase. These disclosures are listed by either the manufacturers themselves; by the auction house, as they do their physical research; or by a professional outsourced company that specializes in evaluating the condition of vehicles. Once we access this information, we begin to disqualify potential inventory vehicles. Once at the auction site, our Buyers begin their pre-sale inspection. Before a vehicle "crosses the auction block", we do a 32 point inspection of the vehicle. This involves identifying any paint inconsistencies, body line inconsistencies, abnormal welding spots, bolts that have been loosened or replaced etc… By evaluating the extent of the inconsistencies, we can evaluate the extent of the damages and even make some assumptions on what may have occurred to the vehicle. Was it a possible vandalism? Was it a scratch? Broken window due to theft? Was it a full front end collision? Was the bumper scraped during a turn? The idea here is to put up "Red Flags" that allow us either disqualify the vehicle from purchase or to purchase it with the knowledge that we will need to do further inspections/research after the purchase at auction. As mentioned in Level 2, we may purchase some vehicles that require additional inspection or research. After purchasing one of these vehicles, we pay a Post Sale Inspection fee to the auction house for performing a detailed inspection of the vehicle. This process involves putting the vehicle up on a hoist, taking tires off, lifting carpets to find welding spots and using specialized equipment and meters to determine the condition of the body, frame, panels, mounts etc… Once this inspection is complete, we assess the results and either disqualify the vehicle or purchase it with additional information in hand. Once our vehicles have been officially purchased, AutoPrice Canada pulls a CarProof Claims Report for every single vehicle in inventory. In short, CarProof accesses a database, in real time, that contains any accident claims data paid out by the vast majority of Canada's insurance companies. This means that if a claim cheque has been paid by these companies to an insured customer, the amount claimed will show in the Claims Report provided. The report will also disclose what type of payout it was. e.g: Miscellaneous, Partial Loss, Accident etc… Every customer receives a copy of any CarProof Report for a vehicle they are interested in buying whether they do purchase it or not. When a vehicle passes the above four levels of inspection, it arrives at one of our dealerships. Once there, the vehicles enters into our reconditioning process which involves body inspection, safety inspection and E-test. During this process, we evaluate and process the vehicles through the Ontario Safety Certificate process as well as the E-testing process. In so doing, we have 1 last level of inspection. Believe it or not, once in a blue moon, we find an issue during this stage and send the vehicle back to the manufacturer's auction. 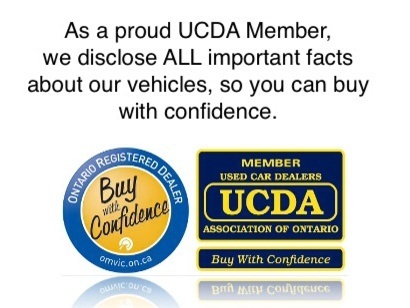 As of January 1, 2010, the Ontario Motor Vehicle Industry Council OMVIC (the government body that controls the vehicle sales industry in Ontario) will require all automobile dealers to disclose any accidents over a value of $3000.00. AutoPrice Canada will declare any amounts over AND under the $3000.00 threshold. We will also disclose any disclosures made to us by the Auction house or Manufacturer on the bill of sale for that vehicle. At AutoPrice Canada, we will continue to disclose information regardless of the value of damages or claims paid out. As a result of our Multi-level Inspection Program, AutoPrice Canada feels very confident that it can provide a No Accident Guarantee. If a Contract of Sale for the purchase of one of our vehicles does not specify any accident history on the first page of that Contract of Sale, then we guarantee that this vehicle has no disclosed accident history.